While it can be painful to watch the ‘action’ during the first week of the preseason, it does tend to be better in the second week. Starters will play more (or at least some). Fans can start to see who coaches may be leaning towards a little. It isn’t quite the product fans go crazy for, but it is better than last week. It is certainly better than nothing! That is, as long as you are not a fan of the Jacksonville Jaguars. Once again, they had a top-five pick in the draft. Once again, they invested a ton of money in free agents. So far, it appears like, once again, they are going to be a terrible team. Tampa Bay, on the other hand, showed a lot of promise. While all observations should be taken with a grain of salt, there were still some worth nothing Thursday night. If you care who won, Tampa Bay did, 12-8. You almost have to feel sorry for Blake Bortles. He looked like a superstar in the making a couple of years ago. But then his game went to heck last season, and it hasn’t looked any better through action in two preseason games. Against Tampa Bay, he was 8-13 for 65 yards in four drives (all punts). Chad Henne wasn’t much better (6-10 for 44 yards and a touchdown). It doesn’t help that the Jags can’t run the ball to save their lives. Leonard Fournette did not play due to a foot injury (sound familiar LSU fans?). But T.J. Yeldon (two carries, two yards) and Chris Ivory (seven carries, four yards) should have been much better than they were. Yes, he only played against third and fourth team guys, but Brandon Allen looked pretty darn good (10-15 for 144 yards and a touchdown). He almost had the go-ahead touchdown to Dede Westbrook on a fade route, but the rookie couldn’t complete the catch. But as bad as the other two guys were, why not give him a shot? Like Allen, he was going against scrubs, but rookie wide receiver Dede Westbrook looked a lot like the play-making stud he was at Oklahoma (six catches for 131 yards; targeted seven times). He didn’t just make great catches. He made guys miss and gained some good ground after the catch. On a positive note, Jags fans may not have to watch Blake Bortles throw interceptions this season. Head coach Doug Marrone sounds serious about potentially benching him. 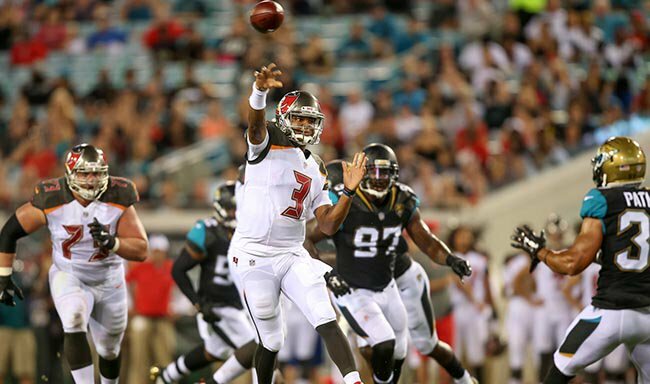 Jameis Winston looked great (21-29 for 196 yards). He looked like he was in midseason form almost. He was sharp, on target, and did an all-around good job of leading the offense. 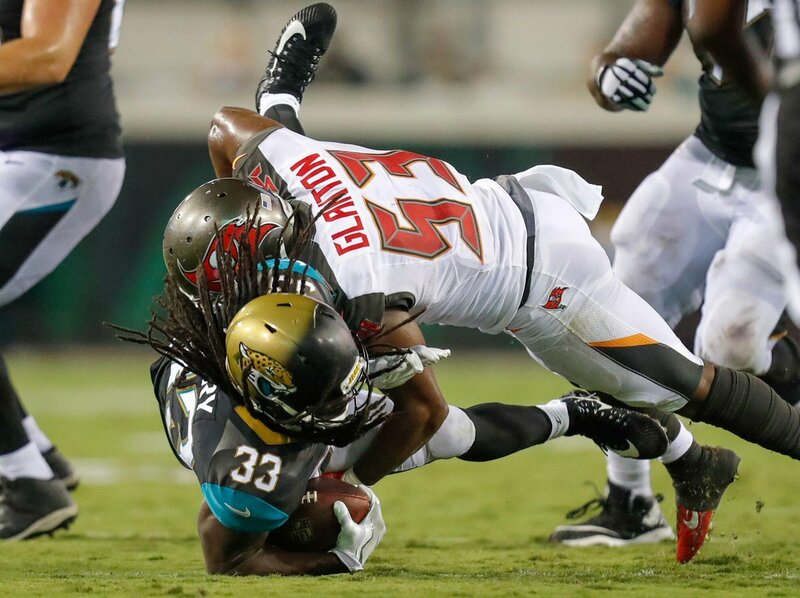 It’s a shame Doug Martin has to miss the first few games due to a suspension. He has looked good so far and should hit the ground running when he makes his return (six carries for 30 yards and a touchdown in two drives). The Bucs admitted drafting a kicker in the second round was a mistake, but did the kicking game improve? Not really. Nick Folk had an extra point blocked and missed a 47-yard field goal. But Folk is a good, reliable kicker. He’ll play better. Chris Godwin and O.J. Howard didn’t do much (two catches each), but both looked good when they did play. Tampa Bay should look even better in the all-important third preseason game (when starters tend to play a lot) with the Cleveland Browns coming to town (8/26 with kickoff at 7:30 PM ET). Jacksonville will try to have a better game when the Panthers come to town (8/24 with kickoff at 7:30 PM ET).